The use of drugs that inhibit bone resorption (“antiresorptives”) continues to dominate the therapy of bone diseases, many of which are characterized by enhanced bone destruction. These disorders include not just osteoporosis but also Paget’s disease of bone, myeloma, and bone metastases secondary to breast, prostate, and other cancers, as well as many less common acquired or inherited diseases such as osteogenesis imperfecta. For osteoporosis, treatments have historically included hormones, such as estrogens as well as calcitonins. Several SERMs (selective estrogen receptor modulators) have been developed, among which raloxifene and bazedoxifene are quite widely used. 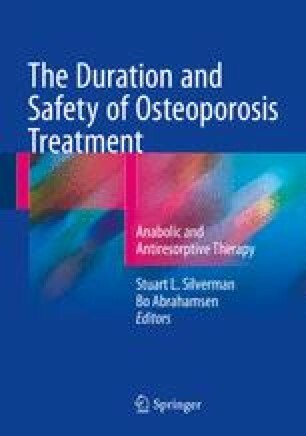 Currently, the mainstay of treatment worldwide is still with bisphosphonates, which have been used clinically for more than 40 years and can reduce fracture occurrence at vertebral and non-vertebral sites, including hips. The most recently introduced new drug is the anti-RANK-ligand antibody, denosumab, which is also effective against these fractures. Several cathepsin K inhibitors have also been studied, but, among these, only odanacatib is close to being likely to be registered for clinical use. The pharmacological basis for the action of each of these drug classes is different, but reasonably well understood, and needs to be considered when determining the optimal ways they can be used in clinical practice. *http://www.mercknewsroom.com/news-release/research-and-development-news/merck-announces-data-pivotal-phase-3-fracture-outcomes-st. *Press release announcing outcome of LOFT trial with odanacatib.